Founded in 1850, the University of Sydney is Australia's first university and is regarded as one of its most prestigious, ranked as the 27th most reputable university in the world. In 2013, it was ranked 38th and in the top 0.3% in the QS World University Rankings. Seven Nobel or Crafoord laureates have been affiliated with the university as graduates and faculty. The University is colloquially known as one of Australia's "Sandstones", a status similar to that of the "Ivy League" in the United States and the "Russell Group" in the United Kingdom. The university's Coat of Arms, granted by the College of Arms are an amalgamation of the arms of the universities of Oxford and Cambridge, and their important figures, heraldry and other references to the two ancient universities are sprawled throughout the university in its architecture and character. Its motto, "Sidere mens eadem mutato" translated literally gives "Though the stars change, the mind is the same", but has been more liberally translated to give, "Sydney University is really just Oxford or Cambridge laterally displaced approximately 12,000 miles". 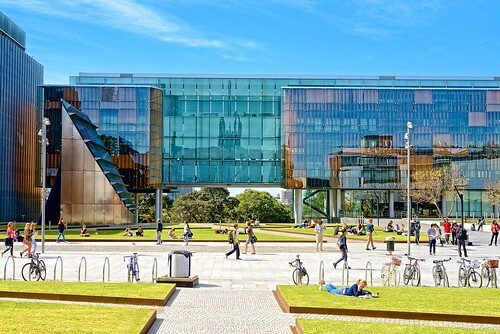 The 2013 QS World University Rankings placed Sydney in the top 20 in the world in 11 subjects; more than a third of the 30 measured. The University of Sydney was ranked 8th in the world for Education, 9th in Accounting and Finance and 10th in Law. Additionally, Sydney was placed 12th in English Language and Literature, History and Archaeology, Linguistics and Civil Engineering and Structural Engineering, the highest in Australia of those subjects. Psychology at Sydney was ranked 14th, Pharmacy and Pharmacology, and Communication and Media were ranked 16th, and the Sydney Medical School was ranked 17th. Its main campus has been ranked in the top 10 of the world's most beautiful universities by the British Daily Telegraph, The Huffington Post and Disney Pixar, among others such as Oxford and Cambridge and is spread across the inner-city suburbs of Camperdown and Darlington. Sydney Law School is ranked 10th in the world and has produced the most Prime Ministers of any university, and the most high court judges. Additionally, Sydney Law School has won the most championships at the prestigious Philip C. Jessup International Law Moot Competition than any other university, and the title of "Best Oralist" title three times. Neither Harvard Law School nor Oxford Law School has ever won a Jessup Championship. 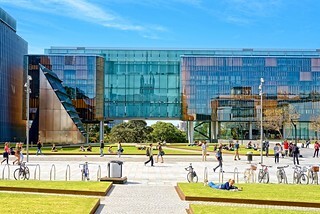 The New Law Building designed by FJMT has been cited as one of Sydney's five best buildings and has won numerous international architectural awards.